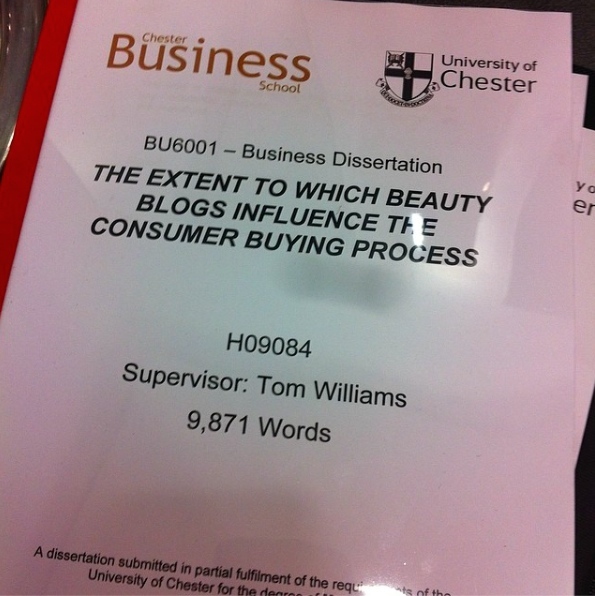 I handed my dissertation is last week, which was the best but worst feeling EVER. Luckily, I had started this blog in July 2013, otherwise I don’t think I’d have had a clue what to focus my dissertation on. Firstly, I’d just like to thank all of you who took part in my research, and completed my questionnaire! I had nearly 200 responses in a week and I really enjoyed analysing the findings! I know when I was conducing the research loads of you said you’d be interested in knowing the results of my research, so I thought I’d write a short post! I think for all of us, we know blogs influence us in some way. Whether it be reading a blog for more information or reading one to justify making a purchase, we all do it. My research found that over 55 different products were purchased after reading a blog post, with the Urban Decay Naked 3 Palette being the most popular with 15 of you purchasing it. I also found that y’all find blogs important when you are collecting information on a product, even if you don’t go on to purchase it. If you were to read blogs that HATED a particular product, you’d be influenced not to make the purchase. I looked at blog credibility, and what you thought made a blog credible. The findings suggested that photos were the most important factor, and that if they were naff you’d click off. I suppose photos are the first thing you see, creating an emotional connection with the reader, and no matter how much you deny they aren’t important, they are. A lot of us judge a book by it’s cover and all that jazz, even if we don’t mean to. I think blogs are so influential, look at the money bloggers like Zoella and Tanya Burr earn. The connection readers/viewers make with bloggers/vloggers is so strong as it’s so easy to relate to someone who is so similar to yourself. We all have a little escapism, sit down with our laptops/tablets, read blog posts from our favourites and youtube videos from our favourite bloggers. As a Marketing student and blogger I find the influence of blogs amazing. I want your opinions, do you think blogs are influential? Is anyone as geeky as me and think it’s freakin’ amazing? Blogs are definately influencial and I’ve been lusting after products that I’ve seen on blogs ever since I started following the feeds. You only need to look at the way PR companies send products to bloggers for review to realise that influence is there – if sales and reputation weren’t increased by this method then they wouldn’t bother. Plus as you’ve said massive bloggers like Tanya Burr make a pretty fine living from it! Thanks for the post it was really interesting! Well done for handing it in, even as a blogger I am hugely influenced on what to buy everytime i’m in Boots! I’m so happy for you that you were able to do your dissertation on a topic that truly interests you, that must have been so good! I definitely agree that blogs are highly influential, if a blogger I love features a product.. I will 70 percent of the time go and buy it. It’s an expensive problem haha!